In my previous post, I mentioned this disc as holding the title of most I've ever paid for a record. It was released in 1977 to much acclaim, even earning a spot on The Absolute Sound's Superdisc List. However, it was released in Australia only, though it was available for a couple of years through some of the importers. Coupled with the fact that the composer John Antill, was not exactly a household name, was it any wonder that when I decided I had to have a copy in 1985, that it took over nine months of active searching stores, auctions and mail order before I found one. It was a local (New York) collector / dealer who had the prize, and it was just a short walk from Central Park West to his Upper West Side apartment. 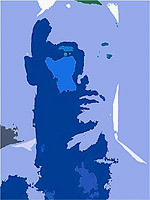 His name was Harvey Gilman and I found out about him through an ad he ran in the back of TAS. I made an appointment and found him to be most gracious, and a brief look around told me I was in the company of a serious collector. There behind the Jadis amps were piles of rare Living Stereo LPs leaned up against the wall, the first of which was the famous Bizet/Gounod: Faust/Carmen LP (the only time I have seen an original). Decca SXL, EMI ASD - they were all there. Casually asking about the price for the Bizet/Gounod, I tried not to appear ruffled at the mere $1,000.00 quoted. Remember too that this was during the height of the great record panic, when people were grabbing whatever they could for fear of not having another opportunity again. And in many instances, they were right. I was happy that we had previously negotiated the price of the Antill on the phone. It was $150.00 firm and I have never regretted it. Thank you, Harvey! After incurring the wrath of my "domestic partner" for spending such an outlandish amount on a record, I tweaked the system and waited for late night, when I could listen without distractions. I had heard the piece before, as I did have the only other recording of it available, which was on Everest, with Goosens conducting the London Symphony Orchestra. Everest has made somewhat of a sonic spectacular with this record, with its exotic instrumentation and percussive effects. I was intrigued enough to take the plunge for the EMI. Piccolo, 2 flutes, 2 oboes, cor anglais, 2 clarinets, bass clarinet, 2 bassoons, contrabassoon, 4 horns, 2 trumpets, 3 trombones, tuba, harp, timpani, celeste and strings. PERCUSSION: xylophone, vibraphone, bass drum, thora sticks, 2 cymbals, 2 gongs, triangle, tambourine, snare drum, slap stick, ratchet, tom-tom, woodblock, sleighbells, castanets, sand blocks, Chinese temple blocks, thunder sheet and bull roarer! The music is based on a dance ceremony of the Australian Aborigines. At nine year old, John Antill witnessed the spectacle of the Corroborree, and it started a lifelong passion to learn and listen to everything about the Aborigine culture. In 1936, he began to sketch out a suite of orchestral dances based on his childhood experience. 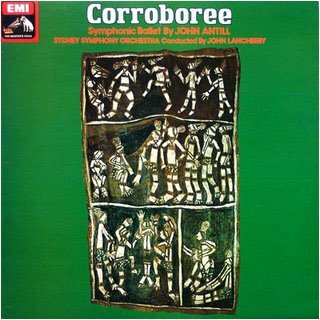 The compostition was presented informally over the years, but it wasn't until 1946, when Goosens declared "John Antill's "Corroborree" is, in my opinion, the most significant work from the pen of a contemporary Australian composer that it has been my privlege to examine". He recorded the suite for Everest records in 1958. Here on the EMI release, the composer conducts the first complete recording of his "Symphonic Ballet". The music is perfect for a candle-lit late night listen (for the adventurous) The opening bars reveal a vast soundstage, the music suggesting peering through the eerie darkness of the jungle, perhaps lit only by a torch. As we make our way through, we are startled by several loud slaps, rather like the sound of a whip of a trap snapping shut. The effect is chilling, but in no way prepares us for the all out orchestral assault that follows. The dynamic range here is astounding, particularly when you consider that the sides are close to 30 minutes each. These themes are carried through much of the score while the dance conjures up images of elaborate rituals, wild costumes, sacrificial dances under the moon and the star lit sky. It is a journey you will never forget. The EMI has several advantages over the Everest, in my opinion. It is the complete score, and the suite omits some fascinating movements. Also Antill is conducting his own work, and who to know better, particularly in this case. The EMI also has the advantage of sound engineering that is more appropriate to the score. The huge soundstage adds the atmosphere that is so important to this work. You feel as if you are in the vast, dark jungle. The Everest has a more up front perspective that while thrilling in it's own right, is more of a sonic spectacular, and is lacking the atmospheric magic of the EMI. The only thing the EMI doesn't have going for it is the price. The record has never been reissued on LP or CD. The Everest has been reissued by Classic Records on 180gm vinyl at $30.00, and it is a must-have. Get is soon, 'cause it will soon be gone. I suggest starting with that, and if you really love the music, search for the EMI. It is worth the effort. Highly Recommended!